DETROIT (AP) — With his major league debut out of the way, Michael Kopech was able to take the mound with a little less fanfare the second time around. 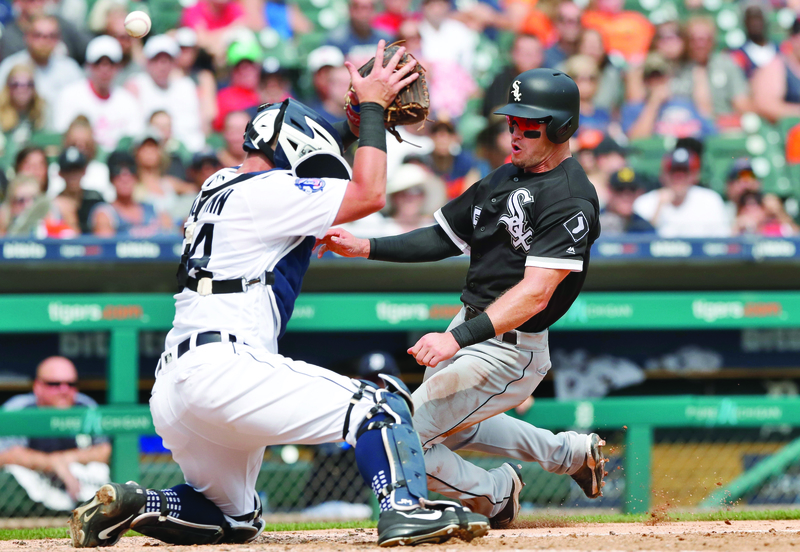 Kopech pitched six impressive innings for his first big league win and the Chicago White Sox scored four runs in the third on their way to a 7-2 victory over the Detroit Tigers on Sunday. Kopech was limited to two scoreless innings when it rained in his debut Tuesday against Minnesota. The highly touted right-hander threw 86 pitches Sunday, allowing a run and seven hits. Kopech (1-0) had four strikeouts and no walks. Daniel Palka homered for Chicago, and Ronny Rodriguez went deep for Detroit. Jace Fry came on in the ninth for the White Sox with the bases loaded and one out, and he retired the final two batters for his third save. Jordan Zimmermann (6-6) allowed five runs and eight hits in six innings for the Tigers, who retired Alan Trammell’s No. 3 in a pregame ceremony that delayed the start of the game for almost a half-hour. Kopech took the mound Sunday and shut out the Tigers for the first five innings. He hit two batters with pitches in the fourth but retired Rodriguez on a fly to center with the bases loaded to end the threat. Zimmermann yielded two straight singles to start the third. He nearly got out of the inning after Yolmer Sanchez lined into a double play, but Tim Anderson followed with a double and Avisail Garcia hit a two-run single. Palka then lined a two-run shot just fair down the line in right to make it 4-0. It was his 19th homer of the year. Yoan Moncada hit an RBI triple in the sixth before the Tigers finally scored in the bottom of the inning. Victor Martinez hit an RBI double, and Rodriguez again came up with the bases loaded, this time with one out. The count went to 3-0 before Rodriguez took a strike and hit the next pitch on the ground for a double play. That was a good note to end on for Kopech. “Any time a pitcher gets into a little bit of a pickle, to be able to get out of it like he did, it’s a good thing,” Chicago manager Rick Renteria said. Rodriguez hit a solo homer in the ninth. The White Sox have won nine of their last 12. Detroit recalled left-hander Josh Smoker from Triple-A Toledo. He came on in the seventh with two on and ended up walking in a run to make it 7-1. Kopech has gone five straight starts without a walk — three in the minors and two in the majors. White Sox: Renteria said slugger Jose Abreu (lower abdominal surgery) is doing well and is expected back this season. Tigers: LHP Daniel Norris (left groin strain) pitched four innings in a rehab start with Triple-A Toledo, and LHP Blaine Hardy (left elbow tendinitis) worked an inning in the same game. Chicago begins a three-game series against the Yankees in New York on Monday night. Carlos Rodon (5-3) starts for the White Sox against Masahiro Tanaka (9-4). Detroit has Monday off before a two-game set at Kansas City. Matthew Boyd (8-11) starts the opener Tuesday night against Jakob Junis (6-12) and the Royals.